When Israeli Prime Minister Netanyahu condemned Erdogan for “comparing Zionism to fascism” and described the Turkish leader’s remark as “a dark and false statement”, I found myself wondering how you would respond to it when you arrived in Turkey. Before your plane landed, a senior State Department official who did not want to be named said Erdogan’s statement was “particularly offensive.” The official’s main concern seemed to be that it would “complicate” your ability to work with Turkey on a number of issues, the crisis in Syria and trade in particular. Because he is a Nazi holocaust survivor, Hajo speaks with a moral authority that neither you nor I possess. How would you respond to his comment? Terse and to the point. The widepread refusal to define Islamophobia as a crime is another result of the smear campaign initiated, about two decades ago, by the 'Clash of Civilizations' sychophants. Netanyahu, an expert at making false statements, is staying true to form. In his 1971 VVAW testimony before the Senate Foreign Relations Committee, Kerry's words had what Gandhi called "truth-force" that still bring tears to my eyes. Had he been the same man in 2004 I believe we would have been spared another term of Bush/Cheney horrors and possibly have transformed ourselves into a moral and decent country that would be pouring tax dollars into the renewable energy sources the world needs rather than our continuing course of imperial mass murder. Spewing hatred against Judaism is just as despicable as spewing hatred against Islam. Spewing hatred is despicable. Period! No one is spewing hatred against Judaism. Judaism is not Zionism. Judaism has been around for millenia - Zionism is a comparatively new political movement begun by Theodore Herzel in Basle in 1897. Before Zionism, Palestinians and Jews lived side by side in Palestine. The fact is that a comparison between the apartheid practices of Zionist Israel in the West Bank can be viewed as those employed by a facist regime. What else do you call it when you have 'Jewish only' roads on which Palestinians travel only at risk to their lives, when Palestinian children languish in Israeli prisons, when Palestinian families see their properties demolished in front of their eyes, are then refused a permit to build elsewhere and, in fact, are charged for the demolition costs, when Palestinians have to face checkpoints guarded by Israeli military every day and their transit through is at the discretion of soldiers. What more of a comparison do you need between a facist state and that of modern day Israel! Had Gadaffi been half as repressive of his people as the Zionist Israelis are on the Palestinian occupied population the West would be justified in blustering about human rights violations - what double standard lets Israel get away with this sort of behaviour while other states are vilified, invaded and destroyed? Oh, yes, it's the 'D' word isn't it. Israel is supposedly the only democratic state in the Middle East - How can you call a recognised 'occupier' democratic? The two don't sit together well and it is a total farce that lip service is payed to 'democratic' standards while oppressing a whole section of your society along ethnic lines. Facts must be faced, rather than faked displays of offence to sensitivities - how sensitive is it to be put in prison under Administrative Detention - no trial, not knowing when and if you will be released. Stop protesting too much - it's wearing thin - look at the facts and not your protestations of being persecuted when you are the persecutor. Alan Hart ... your words are distilled wisdom. Thank you, again. Funny how nobody thought that Erdogan's statement as it concerns Islamophobia was even worth discussing. I guess only the Jews count, we must walk on eggshells around them lest we be accused of spewing hate speech, but Islamophobia is of no important to the zionists. That is because they are the engine that generates most of the worldwide hateful rhetoric against Muslims. Alan - Why you suppose John Kerry's nomination was unanimously endorsed while Chuck Hazel was scrubbed like a dog by the Israel-Firster lawmakers? Simply, bcause John Kerry is a 'Crypto-Zionist'. Kerry's grandparents were Jewish and he is married to Zionist Jew Ms. Heinz. As far equating Zionism with fascism - Zionist Albert Einstein made that comparison in a letter to The New York Times' editor on December 4, 1948 in response to Menachem Begin's visit. I used to admire Erdogan as Mayor of Istanbul for his moral courage – but as prime minister, Erdogan has proved to be an agent of US, Israel and NATO. His government has supported Judeo-Christian imperialism in Libya, Syria, etc. John Kerry has been demonized by the Zionist-controlled media for not making a stop-over in Israel. Jack Dresser is correct. The US has spent trillions of dollars in direct aid to Israel and in wars for Israel, and securing carbon fuel for The Realm. We need neither Israel, nor carbon fuel. "God knows it did not cross our minds to attack the towers but after the situation became unbearable and we witnessed the injustice and tyranny of the American-Israeli alliance against our people in Palestine and Lebanon, I thought about it. And the events that affected me directly were that of 1982 and the events that followed - when America allowed the Israelis to invade Lebanon, helped by the US sixth fleet. Ignore General Clark's ridiculous hammer and nail comment. He is an uber zionist, and knows better. AIPAC and Lobby-corrupted US Congress is key to both problems, Israel and unnecessary loading of our planet's atmosphere and oceans towards an imminent tipping point from which it may not recover, a planet that may end up like Venus. As for Erdogan, he is only doing what he thinks is necessary politically and diplomatically to keep Turkey out of most of the fray going on in the middle east. He has no love for Israel or the US, but he is a pragmatist. He understands the connection between the global economy, western hegemony and the welfare of his own country. Trashing him is naive. John Hagel is no angel - in the end, he did the dance and the flowers were thrown at his feet, and like a good stooge he will do what the zionist-controlled Congress will tell him to do. Kerry was here in Cairo yesterday and hoping he could do some meddling in internal Egyptian politics by proposing to meet with the opposition to Morsi and the Musim Brotherhood. He was ignored. @maryam - Your source is by "the Jews against Zionism" and not against the Jewish occupation of Muslim-Christian Palestine. Please wake-up from your slumber and start visiting Gilad Atzmon's website. Albert Eistein, too, was a Zionist of different kind. if Erdogan is trying only to "protect Turkey" - then he is not a Believer or so-called "Islamist". No Turk leader can advance Turkish national interests without sleeping with western powers and Israel. That's what the Crypto-Jew Gen Mustafa Kemal Pasha aka Attaturk did in 1930s. The same goes for Egypt and other Arab countries which want to become "civilized" in eyes of the western power. John Kerry was in Cairo to buy Morsi's loyalty to US-Israel in return for $4.8 billion loan from IMF - and bring Morsi on board along with Turkey, Qatar and Saudi Arabia against the anti-Israel Iranian influence. Not that it has any real relevance, but Einstein was not a Zionist. He was appalled by the state of Israel, and when he was asked to be its first president, he declined. If you would read the biography that was published about 5 years ago, you would know this. Yes, Erdogan is an Islamist, but his country is secular. This is something he may try to change, but that is up to Turkey's people to either stop him or not. 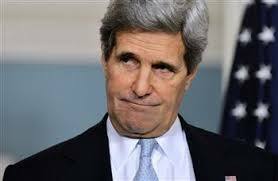 Kerry has reportedly delivered a little money to Morsi, telling him to shape up or no more goodies. This of course is checkbook diplomacy, however, as a woman living in Egypt I can't say that I disagree with Kerry. What I do disagree with is that he and the US seem to think it is their job to police Morsi and his government. It is up to the Egyptian people to deal with Morsi and his policies, his constitution, and his government, not the US'. There is no indication that Morsi is going to buddy up in any big way with Iran. As it is, I doubt Morsi will be in office much longer anyway. He is now about as popular as Bush was in December, 2008. Islamophobia is the "new normal", while any criticism of any Jew for any reason is considered beynd the pale. Vera's comment was strange, seeming to say that islam and judaism should not be hated, but to pretend Zionists base their takeover of Palestine on religion is false. As Uri Avnery wrote in his latest post, Ariel Sharon's provocation of the second intafada in 2000 at the Temple Mount was done by a pork-eating atheist! Religion is just an excuse. True, @Rosemerry, but the settlers ARE fanatically religious as a rule, and they have a very big influence. Netanyahoo and the Likud depend on them for support, and return the favor by protecting the settlements and approving new ones despite their being illegal and internationally condemned. I have a question for you. Why does being a Holocaust victim make one speak with a moral authority that others don't posess? Alan, do you really believe it will ever change? I hope so but as long as the money lenders are still running the temple I wouldnt bet on it. Jesus chased them out 2000 yrs ago and they are back stronger than ever.